The stress caused by an unhealthy small intestine can lead to adrenal fatigue. 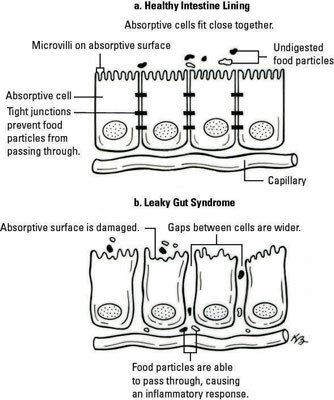 Often, this is caused by an imbalance in gastrointestinal bacteria, which causes a loss of the integrity of the intestinal cells; the tight junctions are worn down, and gaps exist between the cells. The cells have lost the glue that keeps them working well. The standard American diet and a condition called celiac diseases can both be causes of intestinal dysbiosis. Your diet is probably very SAD. The Western or standard American diet (SAD) consists of food that is processed, pro-inflammatory, acidic, high in calories, and of little nutritional value. The diet contributes to the overgrowth of bad microflora in the intestine. That’s a formula for health problems. The American diet is a significant contributor to many of the nation’s health problems. Restrict sugar, fats, and the majority of oils. Note that the type of fat matters. You want to be sure that about a fifth of your diet includes foods that contain healthy fats. Bad fats include trans fats and saturated fats. Good fats are in foods high in polyunsaturated fatty acids; examples include fish (such as salmon and trout) and nuts and seeds (such as sunflower seeds). Increase fruit and vegetable intake — especially vegetables. Your goal should be to eat 2.5 to 5 cups of vegetables and 1.5 to 4 cups of fruit each day. Stay away from juices that are high in sugar. The sugar content negates any health benefit the juice may provide. Remember that sugar increases total body inflammation exponentially; it’s also fuel for Candida. Combine fresh fruits and vegetables to make your own juice. Limit dairy unless the product is fermented, such as yogurt and kefir. Increase your consumption of foods that are not refined or processed. If you eat animal protein, go for fish and lean meats. People who change their diets often experience vast improvements in health. And you can experiment, too. You should consult a holistic doctor or a registered dietitian (RD) for any major diet changes. Celiac disease is an inflammatory autoimmune condition of the small intestine caused by gluten, which is a protein in wheat, rye, and barley. According to an article from the American Journal of Gastroenterology in 2012, approximately 1 in every 141 people is thought to have celiac disease. Our opinion is that celiac disease is more prevalent than that. Your small intestine is where many of the nutrients from the foods you eat and the medications and supplements you take are absorbed. Celiac disease (officially, gluten-sensitive enteropathy) affects your intestine’s ability to absorb these nutrients, creating a condition called malabsorption. The significant nutrient deficiencies that can result from this condition include low levels of iron; folate; vitamins B12, C, and D; magnesium; and calcium. Believe it or not, diagnosing celiac disease can be difficult. Though many people report problems with nausea, abdominal bloating, flatulence, greasy stools, and/or weight loss, many others present with only extreme fatigue or weakness. Sometimes doctors find celiac disease only through elevated liver function from routine tests taken for something else entirely. Although your healthcare provider can order certain blood tests to diagnose celiac disease, right now the best way to diagnose it is to obtain tissue from the small intestine, often through a biopsy. A gastroenterologist does this procedure with an endoscopy. Treating celiac disease basically means avoiding anything with gluten in it, which is becoming easy to do. Some supermarkets and most natural food co-ops have dedicated gluten-free aisles, and some restaurants have gluten-free selections. The Internet is full of purveyors of gluten-free foods. Be aware that gluten isn’t only in bread products; it’s also found in lots of other foods (including some you may not think of, such as soy sauce). Check out Celiac.com for a list of some gluten-containing foods. Make sure that your nutritional supplements are gluten-free, too. Further, you may be surprised to know that certain household products have gluten in them. Look at your hair products, shampoos, skin lotions, or creams. Reading labels is important; you want to avoid anything that contains gluten even if you aren’t putting the product in your mouth. Don’t panic! Having celiac disease doesn’t mean you have to eliminate all grains from your diet. Grains and seeds such as quinoa, millet, and rice are gluten-free and delicious as well.